Epiven are proud to support our clients at each stage of their China journey. Before the vision, the execution and results comes knowledge about doing business or investing in China. Epiven has undertaken significant primary research over the years to aid our clients, because we find much secondary research is un-actionable. Our research is typically presented as reports. Click on the report title below for more information. Epiven was invited by IMD's Family Business Center in Lausanne Switzerland to present parts of this report to its members. Epiven's experience and work with many wealthy owners of family businesses has prompted us to discuss some key generational issues that China's family businesses are facing and to propose ways to overcome these issues. For the past 30 years, China has created over 3.5 million private enterprises, of which, 85% are owned and run by a family. 5% of China's GDP in 2010 was contributed by 3,000 Chinese family businesses, of which, the top 100 families contributed 60% of this 5% GDP. By 2025, the majority of family businesses in China will cease to exist in their current form, due to a lack of family successors. Over 60% of the family owners fear that their next generation are not capable to manage the core businesses of their companies. More than 80% of the second generation don't wish to continue in their parents' businesses. The dilemma presents generational challenges that are a legacy of China's social policy. Overseas Chinese groups are the largest investors in China and are also the most successful business people in China. More than 70% of China’s FDI has been contributed by this group since 1990. Their successes can be largely attributed to how they perceive and deal with competition and uncertainty. Over the years, in our work with Western and Chinese entrepreneurs, investors and firms, we have gained some pertinent insights outlined in this report. 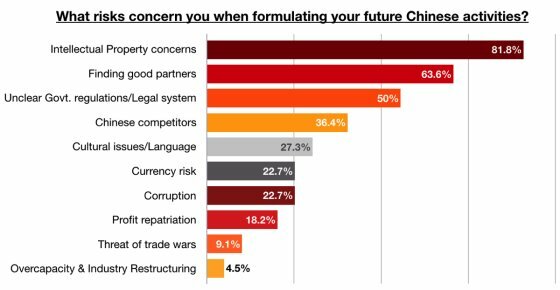 When it comes to any investment, Overseas Chinese businessmen typically focus on the opportunities rather than the risks because in their minds risk is given and is easier to calculate than the opportunities, just as costs are easier to control than revenue. Overseas Chinese businessmen also have a much shorter investment horizon than many Western investors. Conglomeration is viewed as a sign of success because they believe that there are many paths to growth and success. Epiven undertakes to seek out industries with large value creation opportunities related to China. China’s coffee market is not just being driven by GDP growth. While it is a factor, other trends are more critical. The Chinese coffee retail market is growing at a 16% CAGR compared to a 1.1% world industry growth rate. Japan has had a coffee culture for 130 years and coffee started to gain acceptance when Japanese inflation adjusted GDP per capita was circa $3,000. China's current GDP per capita is $3,300. If China follows a similar growth path as Japan, China could become the top coffee consumption market in the near future. Established in the 1950s, China's pension scheme has undergone various reforms since the early 1980s; however, the results of these reforms not only have accumulated large fiscal debts but also have failed to achieve a minimum coverage for China's aging population. Due to China's one-child policy, China is becoming the fastest aging country in the world. In 2010, 12.8% of the total population was over 60 years old. It is forecast by China that by 2050, more than one-third of the population will be aged 60 or over. At the moment, China's social pension account is positive. The increasing pressure and costs of pension liabilities will most likely shift to companies to make up the difference. Corporations in China pay an additional 45% to 50% of labor costs to pay for social related benefits, including pension, housing fund, medicare, unemployment insurance, etc. Epiven undertakes to seek out industries with large value creation opportunities related to China on a regular basis. One such industry that we have identified is the Chinese Cosmetics industry. 154m Chinese have an annual income over €5600 and only spend an average of €5.40 per annum on cosmetics, compared to €120 in Europe, €33 in Taiwan, and €32 in Korea. This middle class population is estimated to increase approximately fourfold to 630m people by 2020. Over the years we have released updated versions of this report as it has had a very favorable response, both from clients and the press, including the Financial Times; China Security Daily and trade journals, such as the European Venture Capital Journal. These reports are based on first hand inputs from Epiven’s network of private equity professionals - Limited Partners, General Partners and portfolio company Executives. We captured their views on investing and doing business in China across the entire Private Equity Value Chain, including Limited Partners with €21b Assets Under Management (AUM) and General Partners with €22b AUM. With a large savings base from the Chinese middle class, RMB 44.8 trillion (€5.6 trillion) in household deposits and few available financial products in China, most financial liquidity traditionally has gone into bank deposits, real estate and the stock market. With the recent changes and relaxation of China's investment rules, China's alternative investment industry is about to morph. State-controlled banks lost RMB 94.02 billion in RMB deposits in January 2014 from a month earlier, while M1, the narrow measure of money supply, climbed 1.2% year on year. Much of this is attributed to a result of the rise of Internet finance as Chinese Internet giants launch wealth management products with more flexibility and higher returns to lure Chinese depositors. Alibaba’s Yu’e Bao, an popular money market fund, offers returns varying from 4.3% to a high of 6.8%, much higher than the 3.25% return offered by state banks. As depositors seek to diversify from traditional assets classes, this opens up new sources of funding for China’s Alternative investment asset classes. Epiven delved into three groups of Alternative investments in China. The first group was "Cultural products" where Art, Wine and Antique investments were examined. The second group was "Financial products" where private equity, venture capital and hedge funds were examined. The third and last group examined was commodity investments, including precious metals. Understanding the opportunities and challenges of China needs to be in the context of (i) your own company's strengths and weaknesses, and (ii) your industry's and competitor's China activities. Epiven has designed a proprietary China Business Benchmark Tool© to support you in your first steps in this understanding. The results are updated regularly, to capture the latest industry logic regarding China business activities. The tool is free and the individual responses are anonymous. It should take approximately 10 minutes to use the tool and benchmark your business.